Healthy eating may seem like an impossible task. Every day it seems that there are conflicting messages as to what is healthy. I can promise you that it doesn’t take a rocket scientist to plan a healthful menu for you and your family. Learning “what” to eat will be simple; the hard part will be following the suggestions. The reason for this isn’t because the food recommended is hard to find, expensive or unpalatable. In fact, the food is very tasty, fresh, easy to prepare and if you bargain shop, it will cost close to the amount spent on the typical American diet. The reason it may be difficult is because our environment is set up to encourage unhealthy eating; junk food is available almost everywhere, including in some schools. Healthy options are not as readily available as fast fried food, and some families have limited access to fresh fruits and vegetables. The best eating plan that you and your family can follow is one made up of mostly whole foods. We were created to eat this way and in fact have been eating this way for most of our time on this planet. It was only with the development of industrialized agriculture that we shifted away from eating what we grew on the farm or picked in the forest to a diet made up of food in boxes, cans and jars. With the convenience that this brought came a host of ill effects like weight gain, heart disease and Type 2 diabetes. Most Americans eat a diet high in processed foods and the thought of completely changing one’s eating habits may seem too scary at first. Because of this, it is best to focus on just one small change until it has become easy and then take on one more change. You will be more successful if you make this a family project involving everyone. It is important to remember that you are teaching your children lessons for life - a healthy life. A healthy diet is one full of fruits, vegetables and whole grains; with low and fat- free milk and meat choices. Our bodies were designed to require food and drink to stay alive. Providing the body with the essential nutrients and water it needs is what the study of nutrition is all about. Our bodies need nutrients that are provided in macro-amounts; protein, carbohydrates, fats and water, as well as essential nutrients in micro-amounts; vitamins, minerals and special plant nutrients. Carbohydrates provide the major source of energy that we need to live, grow and thrive. Every part of our body uses it for energy; without it, we couldn’t survive. Carbohydrates should provide 50-60% of the energy a child needs from food. There are two kinds of carbohydrates; simple and complex. Simple carbohydrates are single sugar molecules and they are found in milk, fruit and refined sugar. It is best to get simple carbohydrates from milk and fruit because with these foods you also get fiber and a host of other great nutrients. With refined sugar, which you find in candy, white table sugar and other junk foods, there is not much else present but the sugar, which is not healthy. Complex carbohydrates are also called starches and they are found in grain products, such as bread, crackers, pasta, and rice. As with simple carbohydrates, there are healthy options and not so healthy options. Grain products can exist in their whole form, which is the best, as nutrients are not stripped off of them as they are in processing to make white flour products. During the processing the whole grain is stripped of its bran and germ layers, which contains fiber, many B vitamins and iron. Examples of whole grains are whole oats, whole wheat, and brown rice. Choosing the whole grain options for the foods listed above will help your child feel fuller longer and the slower absorption caused by the fiber will help to prevent too much sugar from entering the body too quickly. A high level of blood sugar is not healthy for the body and can lead to diabetes if it occurs often over a long period of time. Fiber is the part of the plant that your body does not absorb; therefore, it contains no calories. Its role is to clean out the intestines so that toxins and left- over food particles do not stay too long in the intestine, where they can cause damage. Diets high in fiber have been shown to decrease the risk of heart disease and constipation and are also helpful in regulating blood sugar levels and a healthful body weight. Good sources of fiber include legumes, whole grains, vegetables and fruit. The recommended amount each day is based on the amount of calories consumed; 14 grams of fiber for every 1000 calories. For a child eating 1600 calories a day, they should take in at least 22 grams of fiber. Proteins provide our body with the building blocks it needs to grow. They also maintain and replace body tissue, such as muscles, bones, blood, and body organs. These building blocks are called amino acids. Some we can make and others can only be provided through diet. These are called the essential amino acids and 12 of them are required from the diet for growing infants and children; fewer are required for adults. Foods that provide all the essential amino acids are called complete proteins; milk and meat are two examples. Ten to fifteen percent of the diet should be made up of protein. To figure out how many grams of protein that equals, take your child’s weight in pounds and divide it by 2 (an 80 lb child would need 40 grams of protein a day) or click here link to general requirements table. The best sources of protein are poultry, fish, eggs, low fat dairy products (if over the age of two), nuts, seeds, and legumes like black beans and lentils. 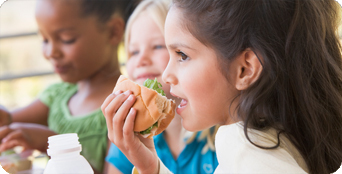 It is important to note that protein deficiency is uncommon in American children as most get the recommended amount of protein they need every day. The exception to this is girls between the ages of 9 and 13, who may not get enough protein. Fat is an important part of a healthy diet. Children need it to grow up healthy, and strong. Fats are an integral part of every cell, they are used to make vitamin D and hormones, they protect the entire nervous system, and they also help to transport some vitamins into our bodies. For young children especially fat and cholesterol are essential for proper brain development. Some foods have little to no fat in them, such as fruits and vegetables, whereas others have a lot. This latter group includes meat, oil, butter, nuts and seeds. There are several types of fat found in the diet. Unsaturated fat is found in plants and fish and is mostly liquid at room temperature. These fats have been found to be heart healthy. Saturated fats found in milk, meat and processed food (palm and coconut oils) is mostly solid at room temperature. They raise the level of cholesterol in the blood and therefore are not good for the heart. The unhealthiest fat is trans fat as it not only raises bad cholesterol, but it also lowers good cholesterol as well. It is found in most processed, baked and fried foods. It is also found in margarine in the stick form; tub and squeeze varieties have less trans fat or none at all. Look for the trans fat free margarines. One component of fat is fatty acids. The human body can produce all the fatty acids it needs except for two; linoleic acid (LA), an omega-6 fatty acid, and alpha-linolenic acid (ALA), an omega-3 fatty acid. The essential Omega 3 fatty acids contribute to the health of the brain, nervous system and eyes. They also decrease abnormal heart rhythms and inflammatory reactions in arteries and may be involved in preventing diabetes and certain types of cancers. Omega 3 fatty acid deficiency may also be involved in attention deficit hyperactivity disorder. Be sure to include rich sources of Omega 3 fatty acids in your child’s diet; fish (sardines, mackerel, and salmon) or fish oils (make sure they have been tested for mercury levels before you buy them) (click here for tips on buying fish link to choosing healthy food/fish tips). Omega 6 fatty acids can be found in vegetable and seed oil. In summary, fat is essential for life, but certain types (saturated and trans fat) and amounts can be unhealthy as they contribute to heart disease, certain cancers and an unhealthy weight gain. Limit fat intake to no more than 30% a day, eliminate trans fat entirely and have most of your child’s fat intake come from unsaturated fat from plants plus sources rich in Omega 3 fatty acids. Note: The Dietary Guidelines for Americans 2005 found that children’s diets are lacking in magnesium, vitamin E, calcium, potassium and fiber. A diet rich in fruits, vegetables (especially dark green, leafy varieties), whole grains, healthy oils, and low fat dairy products will provide all that your child needs to get enough of these important nutrients. Vitamin A is important for vision, bone growth, reproduction and regulating the immune system. Good sources include sweet potatoes, pumpkin, carrots, spinach, turnip greens, mustard greens, kale, collard greens, winter squash, cantaloupe, red peppers, and Chinese cabbage. There are eight B vitamins and they are essential for cell metabolism, supporting the immune and nervous system, and skin and muscle tone. Good sources include fortified cereals, meat, dairy products, fruits and vegetables. Calcium is essential to build and maintain strong bones throughout life and is needed for muscles to work properly. It has also been found to prevent certain cancers. Good sources include dairy products, fortified juices and soy products, green leafy vegetables, and seaweed. Vitamin D is necessary for calcium absorption and because of this it is essential for bone growth and bone health. It is also involved in the immune system; it reduces inflammation and it helps prevent cancer and heart disease. The majority of Americans are deficient in this vitamin due to insufficient sun exposure and the decline in milk consumption. Good sources include fatty fish such as salmon, tuna, mackerel (click here for tips on buying fish (link to choosing healthy food/fish tips) fish liver oils and fortified dairy and juice products. Vitamin E is the most important antioxidant in the fatty part of our cells and as such it is important in protecting our bodies from cancer, arthritis, heart disease, diabetes and infection. Vitamin E is made by plants only. Good sources include wheat germ oil, salad oils, sunflower seeds, almonds, chard, mustard greens and turnip greens. Iron is needed to carry oxygen in our bodies and it is also important for a strong immune system. Good sources of iron are spinach, lentils, chickpeas, beans, and red meat. Children between 1 and 3 years are at a high risk for iron deficiency. Magnesium is essential for strong bones, and proper muscle and nerve cell function. It is involved in so many things that it affects every system in our body. Good sources include green leafy vegetables like Swiss chard and spinach, broccoli, summer squash and sunflower and sesame seeds. Potassium is important for muscles and nerves to working properly and for regulating blood pressure. It also plays a role in preventing diabetes and heart disease. Good sources include many fruits and vegetables, among them spinach, crimini mushrooms, fennel, kale, mustard greens, Brussel sprouts, broccoli, winter squash, blackstrap molasses, eggplant, cantaloupe, and tomatoes. Vitamin K is needed for blood clotting. Good sources include green leafy vegetables, especially broccoli, cabbage and turnip greens, and legumes. Zinc is necessary for healing wounds, proper growth, immunity and reproduction. It has also been found to be effective in reducing cold symptoms. Good sources include red meat, especially beef and lamb, oysters, yogurt, crimini mushrooms and spinach. ou can never get the full benefits of eating a diet high in fruits, vegetables and whole grains from any supplement or combination of supplements. At the same time, your child can benefit from having a multivitamin mineral supplement (with no more than 100 % DV of the nutrients listed) especially if they do not eat the required amount of fruits, whole grains and vegetables every day. In addition to food, children need water every day for optimum health. Because the body does not store water, it needs to be replaced every day. On average, children need 50 to 60 ml of water per kilogram per day. This may seem like a lot but juices, fruit, vegetables and milk will meet some of this requirement. If your child is drinking 2-3 glasses of milk a day and eating plenty of fruits and vegetables, you can give them water when they ask for it. Thirst is usually a good guide for water intake except during certain times: when ill, exercising heavily or as an infant. Children will need more water when they are sick, active or if it is hot outside. During these times, encourage them to drink. Try and limit the amount of juice (100% juice) to 4-6 oz per day in the young child (under 6 years) and 8 ounces for the older child. Even then, it is best to dilute juice with water. Avoid juices that are called “juice cocktail”, “fruit punch” “sports drink” as they add extra sugar to an already sweet drink. Soda and juice account for 10-15% of calories that a child consumes every day. This is a lot when you think that these beverages add little, if any nutrients to a child’s diet and often replace other healthy drinks they should be having; milk and water. A good rule to follow is to limit juice and avoid soda whenever possible. Soda is not an alternative to water for many reasons. 1. The phosphoric acid in soda takes calcium from bones and prevents calcium from being absorbed, a doubly whammy. Note: Phosphoric acid can clean your car battery and unclog your drain. 2. The high sugar content in soda can cause cavities (a 12 oz can of soda has 9 teaspoons of sugar in it). 3. The amount of sugar can lead to being overweight. Drinking 20 oz of soda a day increases a child’s risk of being obese by 60%. 4. The more soda children drink, the less milk they drink, which leads to a low calcium intake. There is nothing healthy about soda. Offer it only as an occasional treat and not as a daily option. Water and milk are the only beverages that your child needs to grow and stay healthy. Put water where it is easily accessible for your child; fill a water bottle or sippy cup in the morning and place it where they can easily reach it throughout the day. In a restaurant, order low fat or fat-free chocolate milk as a treat instead of the soda that comes with the meal. Limit soda consumption to “special occasions,” parties and celebrations. Do not have soda in the house; they won’t be able to drink it if it is not there. Make your own homemade sodas by adding carbonated water to 100% fruit juice.